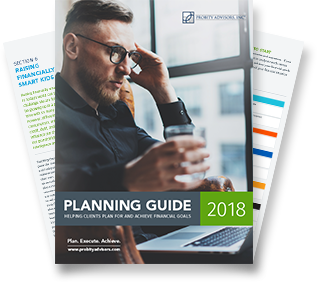 Developed by our team of certified financial planners, the Probity Advisors 2018 Annual Planning Guide will empower you with tools and insights that you can use to make more informed financial decisions. The guide is not intended to be a substitute for a financial advisor or regular, in-person meetings and communication with your advisor. If you do not have a financial advisor and would like to meet with one of our advisors for a no-obligation initial consultation, please call us at 214-891-8131.